I have an Elmo K 100 SM that keeps changing speed on its own. I use it strictly for film transfers and this is a real problem to capture without getting flickering on the screen! Is this just the way this projector runs or is something else going on. I don’t remember having this problem when I first bought it two years ago. 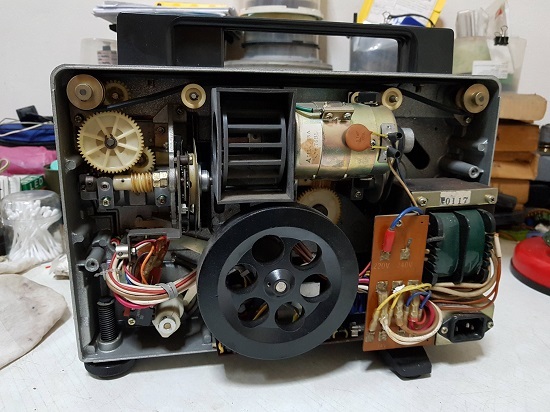 I fix all Elmo super 8 projectors. Mainly sound. I think it could be the motor or the v belt (runs main motor ) . I still have some parts for this machine. So check it out and let me know! Thanks for the quick reply! The unit runs quietly with no apparent motor noise but can it be bad and still sound ok? You also mentioned a “v belt”. Is there just one of them? Thanks. Or maybe it's the speed regulator circuit itself that's about to fail? But since it is usually of a plain simple design with just a regulator transistor and that's about it. So you can't expect any speed accuracy anyway. If the motor seems to be running ok and all the belts look good...then I concur with Nantawat and would look at the board controling the variable speed rheostat. I would remove the small PC board and check to see if that large cap is good.Also check that the solder joints are good and any wiring that might be loose. If the rheostat control bad is bad, is it possible to eliminate it and replace it with an “aftermarket “ controller? 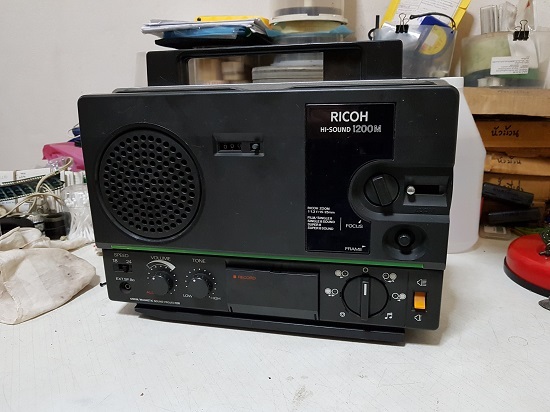 I recently acquired this "as is" Ricoh S8 sound projector dirt cheap (about 33$ include shipping). Upon arrival I've found it to be TOTALLY DEAD,no life signs at all. After assuring that the motor itself and the transformer is fine I dive down to its main power board,realized it to be those faulty bunch of capacitors (around the right side of the pic) that are totally dead. After replacing them it comes back to life again (the amplifier section is still dead however,gonna check it out later). Polt twist : and I'm careless enough to accidentally short-out its regulator transistor,making it now always running at full power regardless of the speed settings. The replacement transistor is still on the way,so it's being "shelved",at least for now. I have very limited testing equipment but I hope someone can help me. Last night, I tested the voltage on the capacitor after turning the unit on and it showed 80 volts. 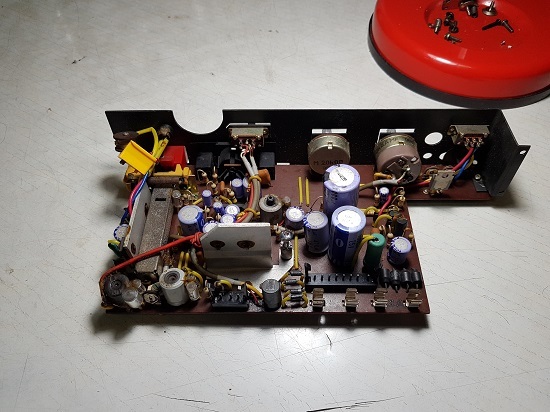 (This is the capacitor on the variable speed controller) Today,I tested the voltage on the main capacitor and it showed about half (40 volts) of what it showed the night before. This is after letting it sit overnight. Is this normal or is this possibly the reason for my erratic speed problem? David, Does the speed switch work? 18-24 fps. Does the variable speed control work? You said the speed fluxes. Try spraying the speed switch and speed control. With tuner cleaner with lubercant. Your speed area could be dirty? Let me know! I still have some parts for this machine! Leon Norris. Hmmm this seems more complicated than I thought. It might be then necessary to check it throughout the entire path - starting from the transformer to the motor itself. Thanks Leon! I’ll pick up some cleaner and give it a try! I’ll let you know how it goes! Dave I would remove the capacitor and check it with a capacitor meter or some voltmeters will measure capacitance. You will need an ESR meter to check it in-circuit. After a few years the resistance can rise on these caps lowering the capacitance...they can look good...but they are not. Thanks Janice! I just bought a new capacitor online. 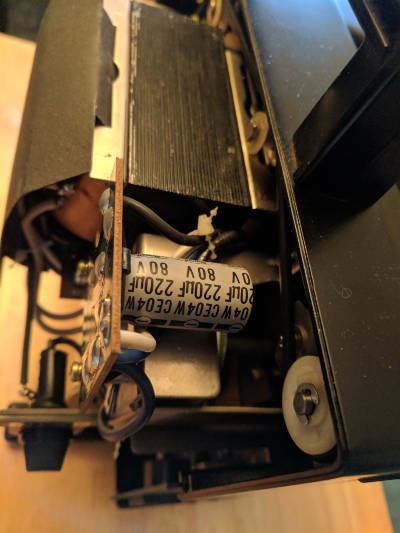 David, just to let you know that its a common problem with this Elmo k100 projector. The Elmo k110 sm is a better choice! The k100 always had speed problems! Good Luck! Leon Norris. Leon, pardon my ignorance but where is the speed switch? I know how to control the “variable speed knob” but not sure about the 18/24 switch? David, Leon might be referring to another model projector. There is no 18 / 24 switch on the Elmo k100. It has a rheostat speed controller and it is a silent projector. Most sound machines have a 18 / 24 switch.